You are here: Home / Content / Is the presentation dead? 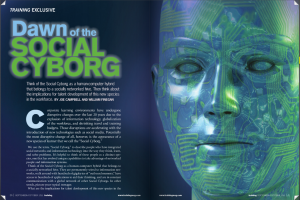 An article in Training magazine, “Dawn of the Social Cyborg,” by Joe Campbell and William Finegan, struck a chord with me. Who are the social cyborgs? They are often young and have “integrated social networks and information technology into the way they think, learn, and solve problems.” The authors compare the extinction of the Neanderthal in the face of climate change and competition with the new species, homo sapiens, to what might happen today to those of us who don’t adapt. Social cyborgs function differently from those who aren’t part of the new, connected world. They learn differently, solving problems by connecting to social networks. They filter information through “open knowledge systems” such as Wikipedia and user-created content. Does this concept affect presentations? You bet! Those social cyborgs are your new audience. And the traditional presentation as we know it is coming to an end. For those of you who present to train, the implications are immediately obvious.Your audience learns differently, not content to just sit and passively absorb information. 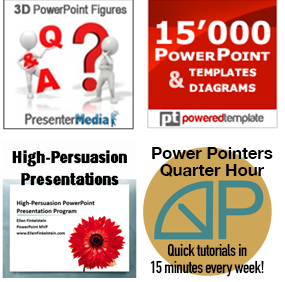 But what about persuasive presentations? I believe that these presentations are affected just as much. Your audience will make their decisions more collaboratively than before, depending less on your presentation alone. Blogs, wikis, discussion groups, and buyer reviews have accustomed people to create their own content and rely on the user-created content of others. They may feel that this content is even more authoritative than you, the presenter! Design training to leverage social and information networks. Target collaborative learning, rather than individual learning. Guide understanding; don’t try to control it. Present to motivate the audience, whether to learn or to act. Yes, interactivity and audience engagement have been around forever, but many presenters don’t use them. This is just another way to get the word out about effective presenting! Awesome tips as always. I’ll share these points on my blog.